You’ve read all about the new website we did for property development firm Bluemantle Ltd.
(What do you mean you haven’t?! Get yourself over to the blog quick!). 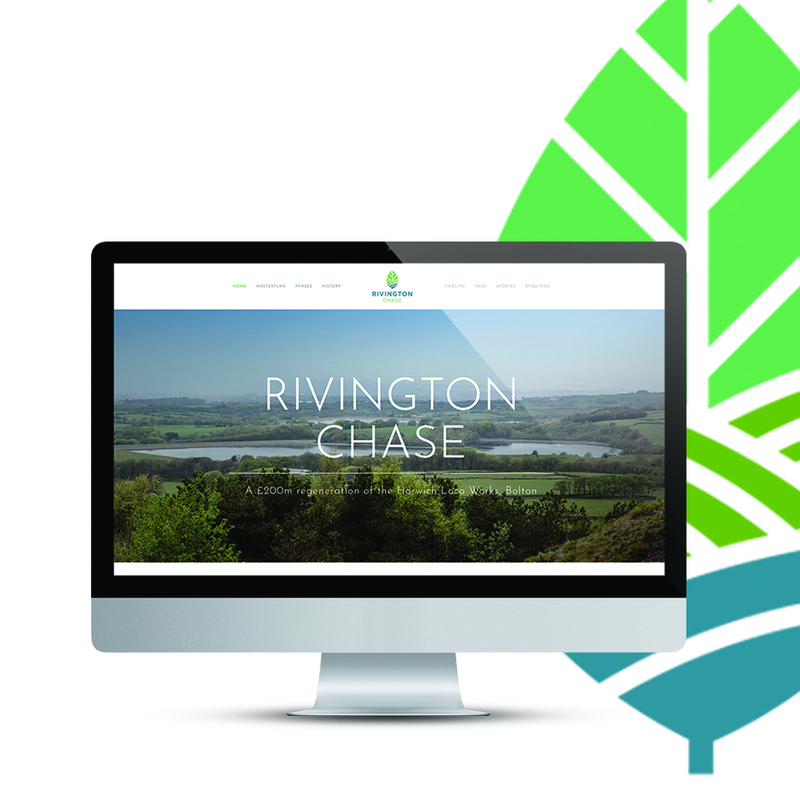 Well, following on from the success of their new site, Bluemantle commissioned us for a further project; the branding and website for one of their most recent developments, Rivington Chase. Rivington Chase is a £200m regeneration of the Horwich Loco Works in Bolton. The project will see a sustainable extension of Horwich, which will provide new homes, employment opportunities, community facilities and open spaces. Horwich Loco Works is an historical site that plays an important part in the heritage and identity of the town; something that the developers are keen to protect and promote as part of the new development. The first part of this project was to create a logo for the new development. The client was keen that the logo related to the heritage of the site and the surrounding nature as well as something that would reflect the high quality of the proposed development. The final logo incorporated a leaf design with a colour scheme reflective of the surrounding landscape. Following this, we were commissioned to design and build a WordPress website for the project. This was to be a location for all information and updates relevant to the new development; including a masterplan, the history of the site, a timeline for the development and FAQs regarding the project. The client was keen that we make use of local imagery, reinforcing the heritage of the site. We also carried through the colour scheme from the logo to the website, again evoking the nature of it’s surroundings. We are hoping to continue our involvement with the Rivington Chase project as it develops, so watch this space for further updates! In the meantime, if you are interested in logo design, or a new website, or you just fancy a chat, get in touch! We’d be happy to talk through any ideas you have to see how we could help with your next project.